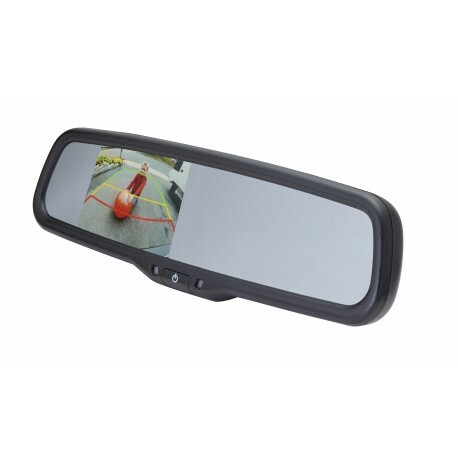 This rearview replacement mirror, designed for universal compatibility, is designed with a seamlessly integrated 3.5” LCD monitor. With dual video inputs, you can attach up to two EchoMaster cameras for better visibility and greater driving safety than ever before. When you reverse, the monitor automatically activates, accompanied by on-screen parking lines that show you exactly where you’re headed as you park or back out of a parking space. Once you get the hang of it, you’ll wonder how you ever went without a helpful camera and monitor system. When not in use, the monitor dims itself automatically, eliminating driving distraction while conserving power. An included remote control also allows for manual control, giving you versatile options for making the most of your rearview mirror monitor.